Photo: "Blast Lock Doors, Silo No. 1"
100 feet below the surface, inside a pitch dark Titan I ICBM Missile Silo, looking through a blast lock door. These doors protected the complex from an explosion inside the silo or an attack on the silo. Each of the silos was separated from the complex by 2 blast lock doors. You can see the second set in the background of this image. This B-52E aircraft was used by General Electric in the 1960's to test their TF-39 engine and was disposed of in the desert after the tests. Fast forward nearly 30 years later to 1991 when the Strategic Arms Reduction Treaty (START) was signed and 350 nuclear bombers were being destroyed as part of the agreement. The Russians saw this bomber on aerial footage and soon after, the US destroyed the aircraft by placing explosives in the fuselage. Inside the Administration Building at the Mare Island Naval Shipyard. 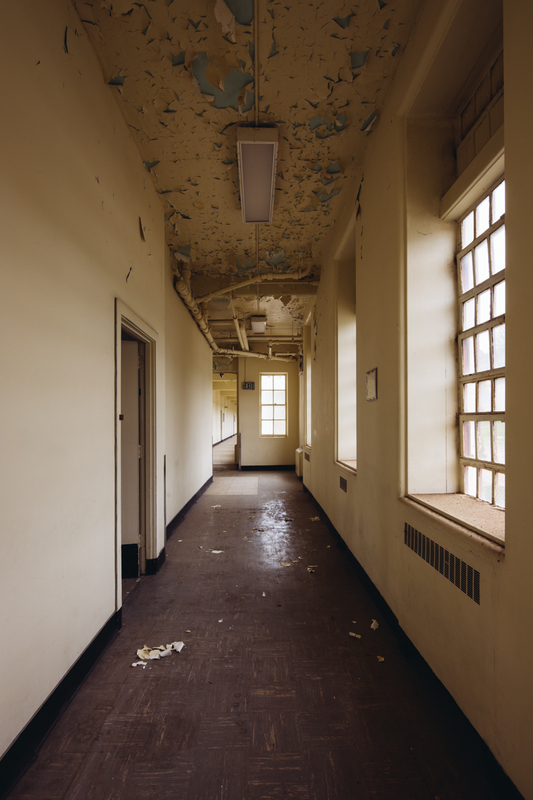 The Mare Island Naval Shipyard Hospital was constructed when the shipyard was established in the late 1800's, however the beautiful, original building experienced severe damage in an 1898 quake. The replacement building shown here is the central section of a three and four story building and a great example of Beaux Arts classicism. Not only that, but it is unique in style for the shipyard. Since the building's inception, many modifications have been made, including drop ceilings, many new layers of paint and the addition of better HVAC systems. Photo: "Winery & Fuel Depot"
This location was a former winery, once known as the largest in the world, which closed down in 1919 due to prohibition. In 1941, the Navy purchased the land and turned the property into a fuel depot, which remained in operation for 54 years. Cot inside an emergency shelter at a former Northern California Navy fuel depot in use from 1941 through 1995. This large 1940's era building connects with the original 1800's Administration Building and is significant in its architecture as it was the most successful 'modern' building on the base. This former base was used by the Army Reserve from 1911 until it closed in 1995. During the first few years of operation, the main goal of the base was to use hydraulic suction dredges to widen and deepen the California River Delta sections to make for easier transport. Since TheSouthern1800 trip to a few Southern states in May, I haven't explored too many abandoned buildings. I miss the asylums and hospitals, waking up at 3am to be in the buildings for blue hour and dawn, the hours spent in the car listening to music and getting to know your travel companions. A few weeks ago, some of that longing was fulfilled when a friend invited me to this old shipyard to photograph a few of the buildings I hadn't yet explored. This is an old military barrack at the former Mare Island Naval Shipyard, which housed around 100 military personnel when the base was in operation from the late 1800's to the late 1990's. 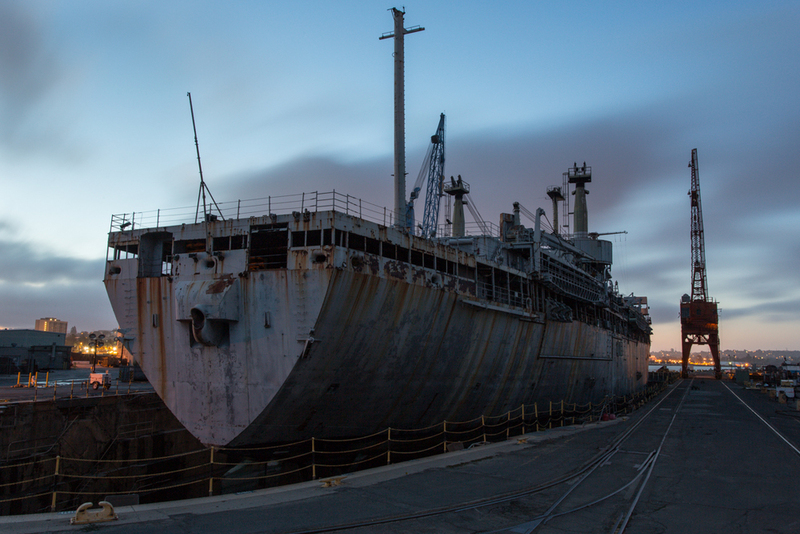 Around California, most of the abandoned historical locations once belonged to the military. Land is so expensive here that when most things become abandoned, they are torn down and replaced by something new. 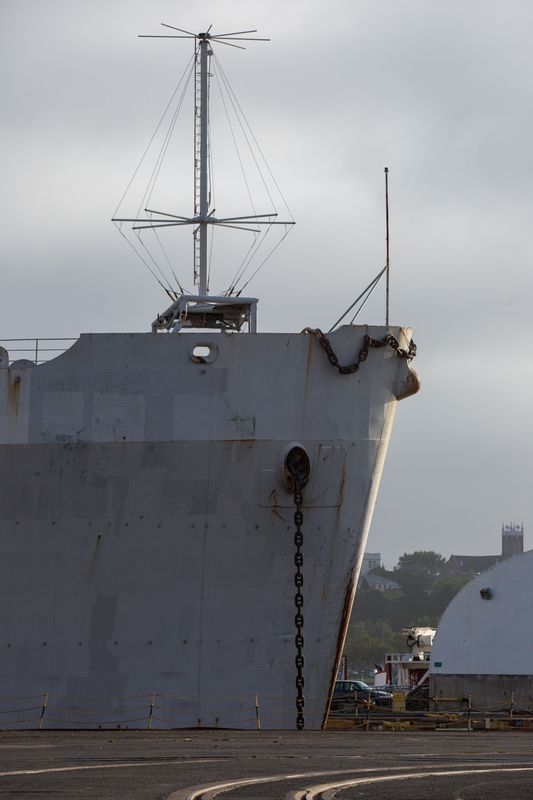 The old shipyard and military bases are typically the longest standing abandonments in the area. The Administration Building was construction in 1870, however many modifications have been done since. Here, you can see the drop ceiling and light fixtures. One another note, I'm really excited to see what +SmugMug has up their sleeve during the unveiling of the new design today! The Administration Building at the former Naval Shipyard in Vallejo, California is the oldest building's on the grounds, but since the construction in 1870, many modifications have been done. Here, they have added ceiling tiles, carpet and modern office lighting fixtures. Photo: "No Smoking, In Bed"
The stockade, at a former California military base, was designed to be a short-term holding for inmates, before being transfered to a penitentiary in Kansas. 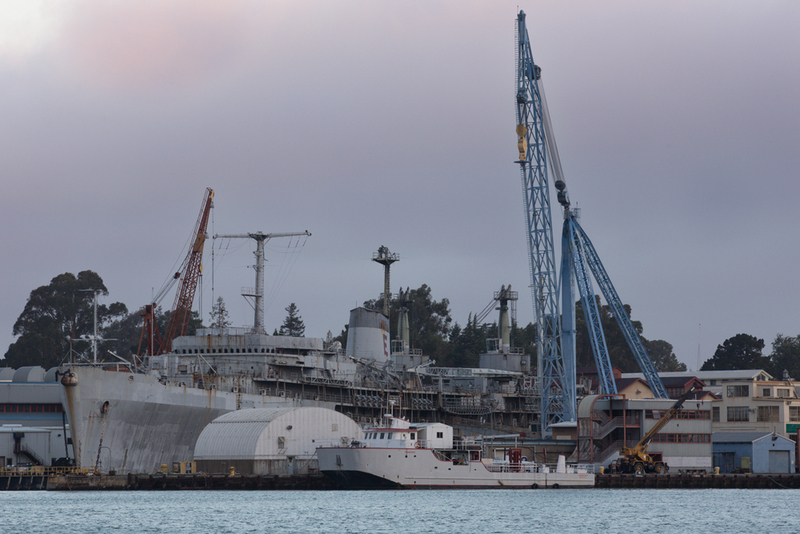 The Mare Island Naval Shipyard contains several hundred buildings and other structures, all erected at various times throughout the 120-year operation and constructed in a variety of architectural styles. Among these structures are the Naval Weapons Station, Marine Barracks, Nuclear Power School and Combat Systems Technical Schools Command, Hospital and Power Plant.